What does Done Deal Pro cost? A year subscription to our subscriber information is only $29.95 a year. This will provide you access to our entire database of film & TV (literary) deals which includes the logline for each project, writer's name, writer's reps, producers, production companies and/or studios involved, genre and more. We also offer free resources including forums, contest listings, examples of contracts & agreements, interviews and links to screenwriting websites. Why should I subscribe to your site? How can it help me? 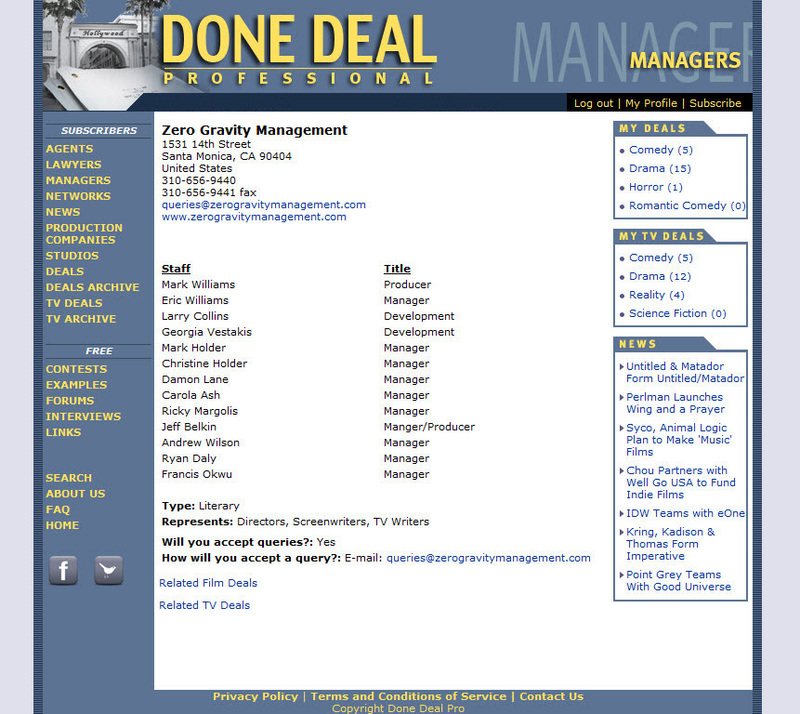 There are two key ways Done Deal Pro helps writers and even industry professionals. First, our site provides the easiest way for one to quickly see each day & week what material is being set up in the film & TV industry. You can track what various screenplays, books and other IP studios, networks and production companies are focused on and what stories seem to interest them specifically. If you have written a comedy or a horror film, for example, you can research which producers have picked up similar projects. You can also discover whether anything similar to your storyline has been set up before with a particular company. Our site helps you strategize how and where to focus your efforts. Second, via our advanced search pages, you can research what types of material (film or TV) different agents and managers commonly represent. Which writers they rep or have repped in the past. You can analyze their history of deals to discover how many projects they have set up in the past, trends in what they are interested in & respond to, etc. Our information can help writers like yourself figure out who to possibly target when sending out query letters. Knowledge is power and knowing the history of the deals a producer, agent or manager has been a part of can greatly inform who you contact and why. Whenever we learn of a deal. Normally, we post deals early each weekday morning. Be sure to check back during the day though, because listings may be posted at various times, and we do more than one update a day when necessary. Do you list all the sales and options that occur in Hollywood? No; that would be impossible for site or any other site/service to do. But we do list every sale we find. We do our best to be thorough and to provide as many details as possible on each deal. What does your information look like? What is included? Can I see examples? Sure. 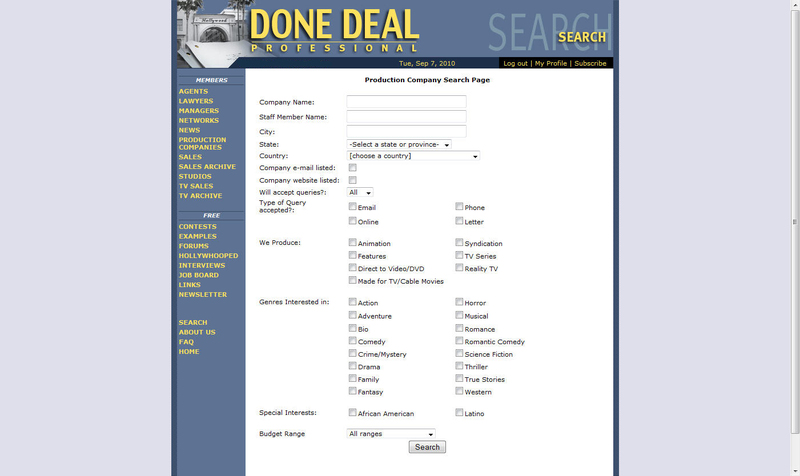 Here are links to screenshots to give you an idea of how we list the deals, present company and management contacts, for example, and provide search for all the projects, reps and production companies listed in our database. Please keep in mind we list all the info we can for each company including staff lists and try to keep each listing as updated as possible. We list some e-mail addresses for companies but we cannot do so for all; and in most cases we do not list individual e-mails for staff members. Addresses, phone numbers, website URLs, and even social media links are included when and where available so additional research can be conducted as desired. I am only looking for contact information. Is your site right for me? Our main focus is listing the various literary deals in the film and TV business. As noted above, we include what contact info we can for the various the agencies, management & law firms and companies involved with each deal. But please keep in mind, we are a small site which charges very little each year and thus we do not have the overhead and staff to compete with the much larger, more expensive services. Where in the world do you find all this information? We search the trades, magazines, newspapers, electronic news resources, and even the Internet. In some cases, we are contacted directly by the agents, managers, producers, and writers themselves who provide us with the information. How do I submit my material to your site? You don’t. 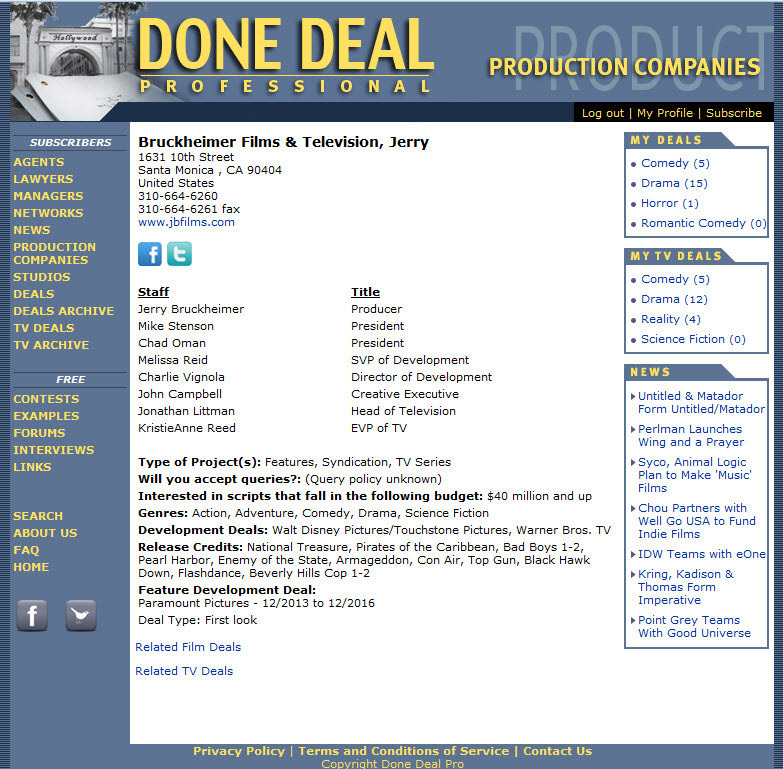 Done Deal Pro is not a production company or a query service; it is a screenwriting news and resource site only. We do not accept submissions, nor are we able to read and evaluate your work. How do I list my company or submit my contest to your database? Please write us at submissions@donedealpro.com for company listings or listings@donedealpro.com for contests, and we'll provide you with a link to our submission forms. All submissions are subject to our approval. Why do you only have a pay site now? 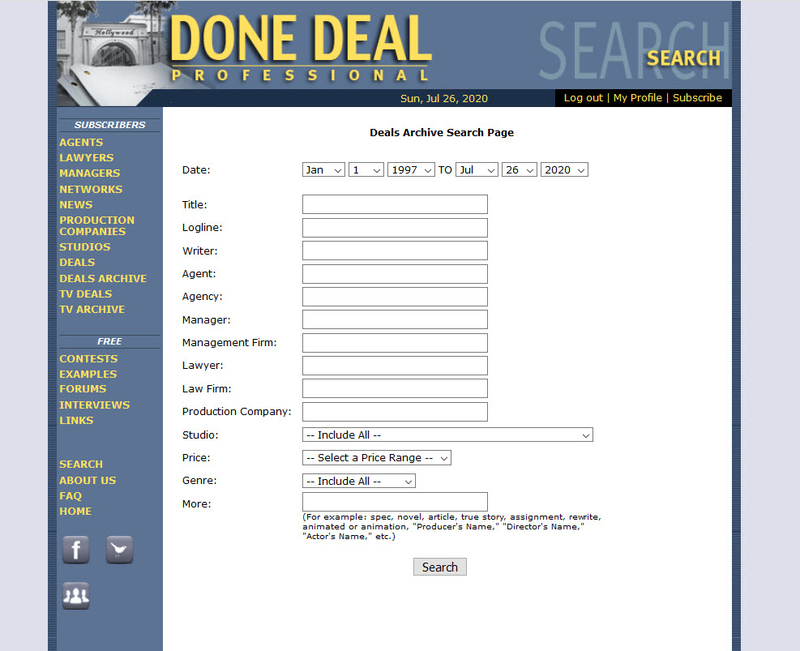 We charge for Done Deal Pro because it was expensive to build and takes time & money to maintain. Since it is database driven, it offers many more features and capabilities than our free site did. We hope the nominal yearly fee will be sufficient to maintain the site while at the same time not be prohibitive for cost-conscious users. I think I may have been double charged. What should I do? We manually process all credit card/subscription charges on a delayed basis. This allows us to prevent any extra charges from showing up due to someone clicking on the subscribe button more than once, for example. Unless additional charges appear on a hard copy, printed bill from your credit card, then you have not been over charged. On occasion, if someone's card does not go through properly due to the wrong billing address being entered or the security code being incorrectly typed, then	an authorization(s) might temporarily appear on their account. This is not a charge and it will disappear. Please be sure to contact the bank that issues your credit card to veryify the accurate billing address they have on file for the card before trying again and/or contacting us. Can I give you feedback, suggestions, or corrections? Absolutely. We always appreciate corrections and feedback. 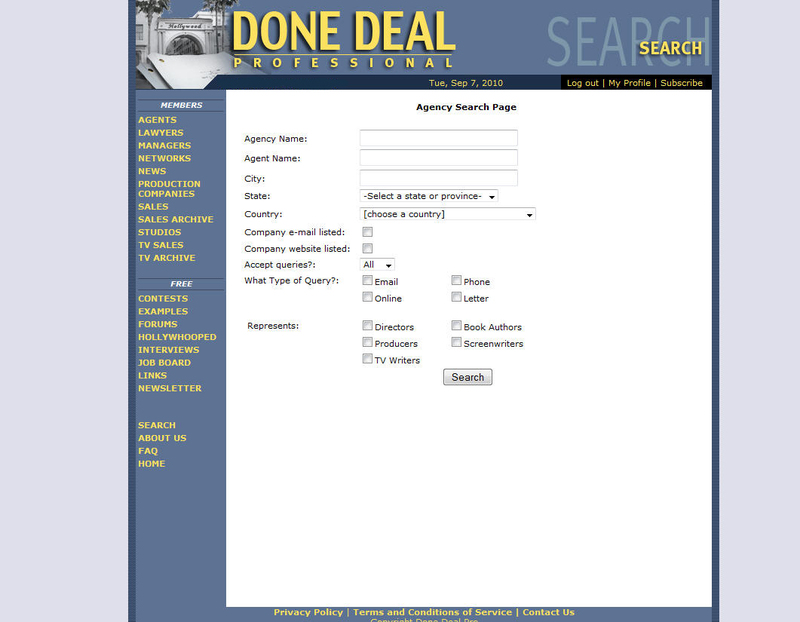 We list over 2,100 production companies, agencies, management firms and law firms. In addition, our database contains over 6,000 names of staff members. If you notice that information is out of date or a name is misspelled, for example, please send us an e-mail specifically detailing the change and we will try to correct the error as soon as possible. We are grateful for any and all help in keeping our data as current & accurate as possible.